With the state’s goal to reach 100 percent renewable energy generation by 2045, the Hawaii State Energy Office (HSEO) is leading the state’s charge toward clean energy independence. HSEO is committed to developing and deploying high impact solutions that will maximize Hawaii’s renewable energy resources and improve efficiency and transportation standards. Through effective policies and innovative programs, HSEO has positioned Hawaii as a leader in clean energy innovation, which will generate quality jobs, attract investment opportunities and accelerate economic growth. 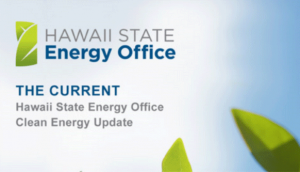 The Hawaii State Energy Office’s (HSEO) mission is to maximize Hawaii’s energy self-sufficiency and security by developing and utilizing local energy resources in a balanced way. In doing so, HSEO will guide our state toward the Hawaii Clean Energy Initiative goals to achieve 100 percent renewable energy in the electricity sector by 2045, reduce electricity consumption by 4,300 gigawatt-hours by 2030, and reduce petroleum use in transportation. To this end, HSEO works toward the deployment of clean energy infrastructure and serves as a catalyst for energy innovation and test bed investments. 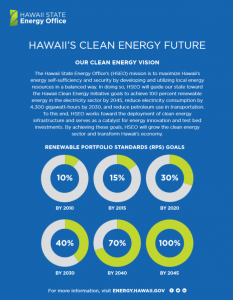 By achieving these goals, HSEO will grow the clean energy sector and transform Hawaii’s economy. HSEO is committed to maximizing the deployment of cost effective investments in clean energy production and management for the purpose of growing the economy while promoting Hawaii’s energy security. To do this, HSEO has established a five-point policy directive, rooted in its vision for a clean energy economy. 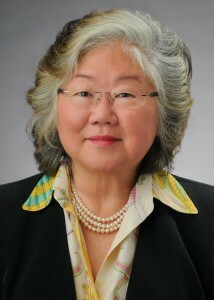 Carilyn Shon is Administrator of the Hawaii State Energy Office, a post she was appointed to in July 2017. As Administrator, Carilyn develops, manages, and implements statewide energy programs, policies, and initiatives that support Hawaii’s clean energy transformation. Carilyn comes with 17 years of experience as the Energy Efficiency Program Manager where she was responsible for implementing projects and programs that contribute to the Hawaii Clean Energy Initiative and the state’s energy self-sufficiency and efficiency objectives. Carilyn has extensive experience working on a number of energy programs, including sustainable/energy efficient building programs for commercial and residential buildings; building code updates; legislative initiatives for efficiency and renewable programs; utility planning for programs before the Public Utilities Commission; renewable industry support and coordination to promote renewable energy use in Hawaii; and partnership programs with the private sector, federal and county entities, and other state agencies to promote efficiency and renewable energy programs. She is a Leadership in Energy and Environmental Design, Accredited Professional, Existing Buildings/Operations and Maintenance. Through her leadership Hawaii has received three National Governors Association (NGA) awards for participation in the Policy Academy on Advanced Energy Strategies for Buildings and the Center for Best Practices, as well as participation in NGA’s workshop on Innovations in Energy Efficiency Policy. For six consecutive years Hawaii has received national recognition from the Energy Services Coalition’s (ESC) Race to the Top award as the leader in per capita investments achieved in performance contracting and for “outstanding commitment to energy efficiency, environmental stewardship and economic development through Energy Savings Performance Contracting.” In 2016 and 2017, ESC also recognized the State of Hawaii as an Energy Stewardship Champion for “the state’s outstanding accomplishments in leveraging Guaranteed Energy Savings Performance Contracting to achieve infrastructure modernization, environmental stewardship, and economic development.” ESC is a national nonprofit organization of experts working together to increase energy efficiency and building upgrades through energy performance contracting. In 2015 Carilyn was honored with the Manager of the Year award for DBEDT. 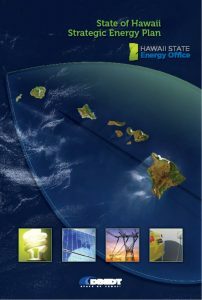 The Hawaii State Energy Office is pleased to share its brochure, State of Hawaii Strategic Energy Plan (PDF). This informational piece gives an overview of the state’s four strategic goals: promoting energy efficiency, diversifying our energy portfolio, establishing a 21st century grid, and accelerating clean transportation. Hawaii State Energy Office works toward the deployment of clean energy infrastructure and serves as a catalyst for energy innovation and test bed investments. Read more in the Hawaii’s Clean Energy Future (PDF) handout. THE CURRENT serves Hawaii’s businesses and policy makers in making informed decisions about clean energy investments and policy. Hawaii’s clean energy sector is a significant driver for economic development to replace fossil fuel expenditures with home-grown industries that stimulate smart economic growth for future generations of Hawaii. The Department of Business, Economic Development, and Tourism is Hawaii’s resource center for economic and statistical data, business development opportunities, energy and conservation information, and foreign trade advantages. For more information, visit Department of Business, Economic Development, and Tourism.